Croick really comes alive when the rut starts, so we are always alert for the first roar from our red stags, signalling that the rut is getting underway. Ali heard the first roar this year, early in the morning of 9 September. By this morning more roars could be heard. As always, the rut seems to start in Glaschoill Wood, one of the big new native caledonian forest schemes. There are a few deer in the wood now and they obviously thrive there, with plenty of food and great shelter in the fast growing trees. The numbers are sufficient to ensure they are starting to manage the lank grass and long heather, but too few to any damage to the trees, most of which are 15-20 feet tall now. 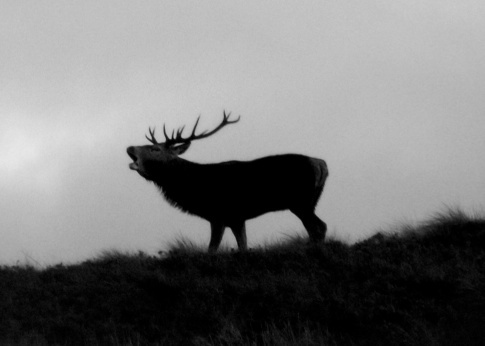 Because it is such a good place, the deer there are in good form and the wood holds some of are largest stags. I assume it because they are in such good order that the rut always seems to start first with those deer. The next few weeks will be the best of the year.